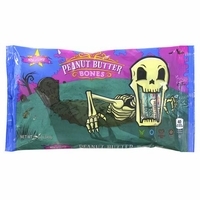 Peanut Butter Skeletons bones are just like the old time peanut butter bars from Atkinsons with a Halloween twist. You get the crunchy and crisp peanut butter bar wrapped in a Halloween wrapper making it look like a bone. You get 34 individually wrapped skeleton bones per bag.